On June 28, 2013 as part of the American Library Association (ALA) meetings two prominent book publishing industry associations offered a joint afternoon program: NISO/BISG 7th Annual Forum: The Changing Standards Landscape EBooks: Discovery & Metadata Exchange, File Formats and Functionality, and Meeting Patron Needs. Much of the event focus was on libraries and metadata. Let’s cover those first as most of this blog’s readers are not primarily focused on libraries. NISO’s Todd Carpenter kicked off the proceedings with a look a changing metadata standards for public libraries, Whither Bibliographic Data? Designing a roadmap to a new bibliographic information ecosystem. Richard Wallis’s 100-slide presentation, Metadata — Linked Data can’t be downloaded but is viewable here. John Law of ProQuest presented on EBook Discovery and Requirements for Metadata. His talk was focused exclusively on libraries. Moving beyond libraries one talk reviewed the essential and still-evolving area of ebooks and accessibility. Suzy Haines, Digital Content Manager for Benetech/Bookshare, presented on Reading for All: Accessibility in a Digital World. She pointed out that while 30 million Americans have print disabilities only 5% of books are accessible. The marriage of EPUB3 and DAISY remains a bright beacon but there’s much work to be done. The final presentation was by Roger Schonfeld, at ITHAKA, on the role and value of the scholarly monograph. In the midst of these presentations, Len Vlahos, executive director of the Book Industry Study Group (BISG), presented on File Formats and Functionality: The BISG Device Support Matrix. BISG provides a valuable service to the book publishing industry by keeping track of who does what when it comes to industry standard file format support for ebooks, EPUB 3. BISG offers the EPUB 3 Support Grid. The three charts in succession were designed to demonstrate that the old digital book standard, EPUB 2, couldn’t cope with illustrated non-fiction titles and certainly not children’s books. 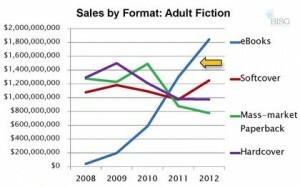 Only adult fiction ebooks climbed above their print brethren (although not above all three formats combined). EPUB 3 is hugely more versatile, and hence worth BISG’s efforts to track its adoption. 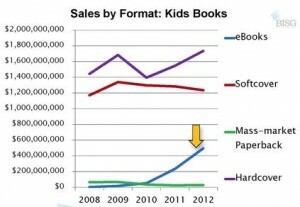 What I find remarkable about the three charts is the overall victory of ebooks against print. Generally all print categories are trending downwards. Only ebooks are consistently on a sharp upward curve. 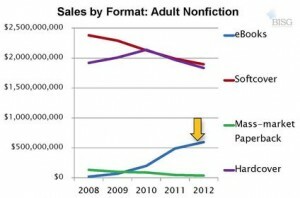 Apart from total sales, ebooks were the only sure bet from 2008 to 2012. And for the future?